Understanding how dancers move has important real-world implications, too. In our work, we’re studying gait and balance in different populations, as well as how holding hands – such as in partner dance – can actually help people walk and balance better. The ultimate goal is to help better design and prescribe rehabilitation to those with reduced mobility, as well as to develop robots that can physically interact with people to help with both motor assistance and motor learning. It’s easy enough to distinguish a dancer from a football player just based on the way they walk in everyday life – one glides like a liquid, the other is grounded and solid. That fits with our finding that ballet training alters how a person walks. But it also counters the sports training principle that motor skill is specific to the practiced movement, such as such as swinging a bat or doing a cartwheel. On the other hand, rehabilitation relies on the idea that motor skill generalizes across different tasks. It would be impossible to practice every possible scenario a person with mobility impairment will encounter in real life. Therapists hope that helping patients develop strength and skill in a few tasks in the gym will be generalizable to improvements out in the world. In a study led by Andrew Sawers, now an assistant professor of kinesiology at the University of Illinois at Chicago, we didn’t look at ballet dancing per se. Instead we took advantage of the dancers’ rigorous, years-long training regimen to test whether learning to move in a specialized context affects how we perform everyday tasks. We wanted to know whether ballet dancers actually differ from you and me in performing tasks that they didn’t explicitly practice. It turned out that, when confronted with a challenging, narrow beam, ballet dancers still used the same preferred, habitual patterns of muscle coordination that they used when walking across a normal, level floor. These patterns are called “motor modules”; the nervous system uses them to construct movements, akin to the concept of “muscle memory”. To find each participant’s motor modules, we measured the electrical activity from many muscles in the leg and trunk as they walked across beams of varying difficulty. 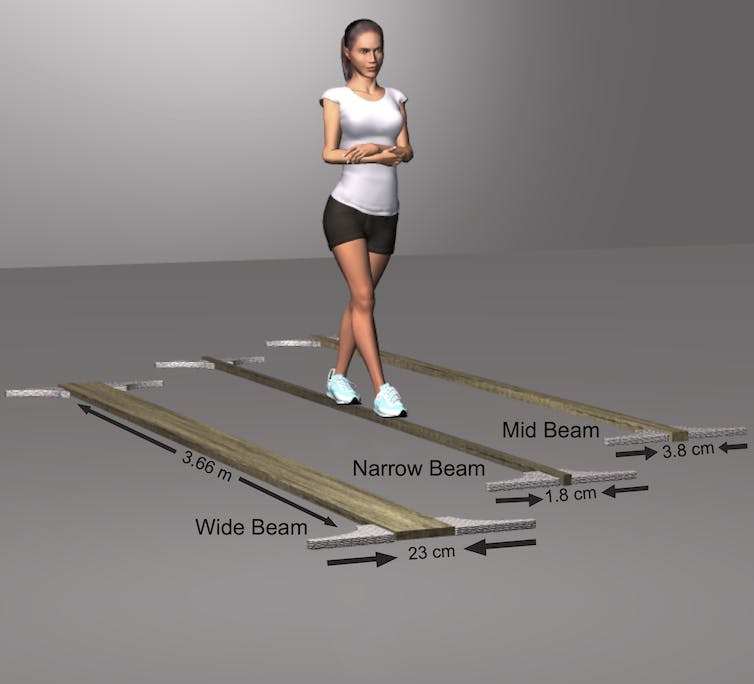 In contrast to the ballet dancers, non-dancers who struggled to traverse the beam couldn’t rely on the same motor modules they used in normal walking. Why? 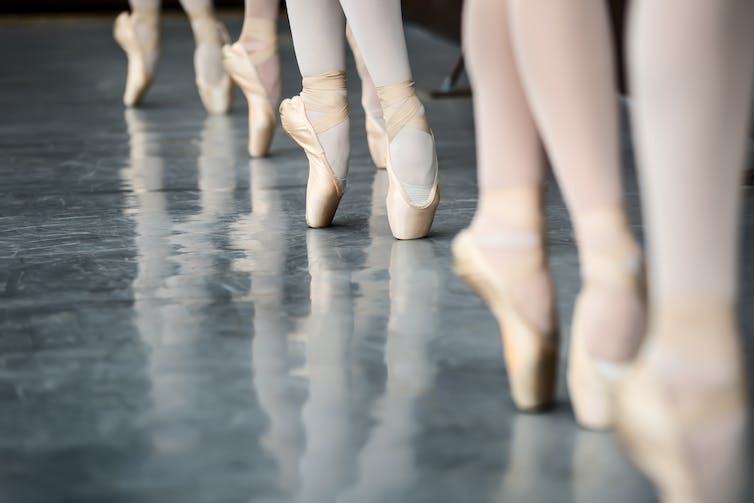 Our research suggests that the long-term ballet training of the dancers refined a set of motor modules used for walking so that they could also be applied in more challenging related tasks; this in turn changed how dancers walk in everyday conditions. The same principles of motor skill acquisition in highly trained individuals – like the ballet dancers – may also be at play in rehabilitation and motor skill reacquisition in people with mobility impairments. Dancing can be effective rehabilitation for balance and gait impairments, particularly in people with Parkinson’s disease (PD). 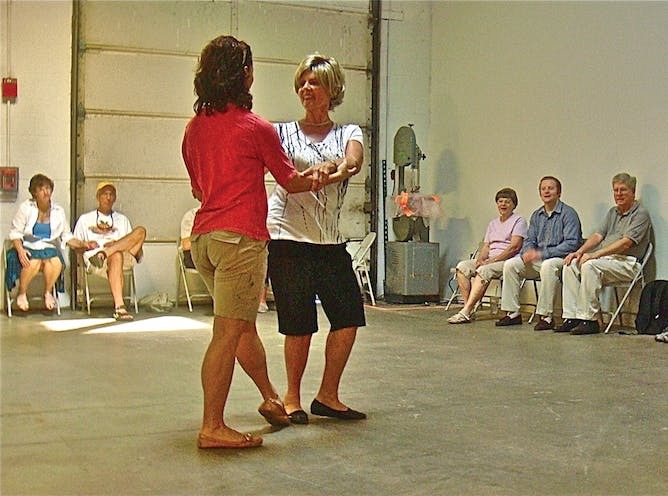 Madeleine developed Adapted Tango rehabilitation, in which participants learn a progressive series of tango dance steps specifically designed to address problems that people with PD have with balance, forward and backward walking, turning and navigating complex environments. It improves clinical metrics of balance function and walking. But how? In a pilot study, we found that after an intensive three-week program of adapted tango rehabilitation, participants with PD became more like the highly trained ballet dancers. Lucas McKay, an assistant professor in Biomedical Engineering at Emory specializing in mechanisms of balance impairment in Parkinson’s disease, showed that participants improved muscle activity for balance after adapted tango. 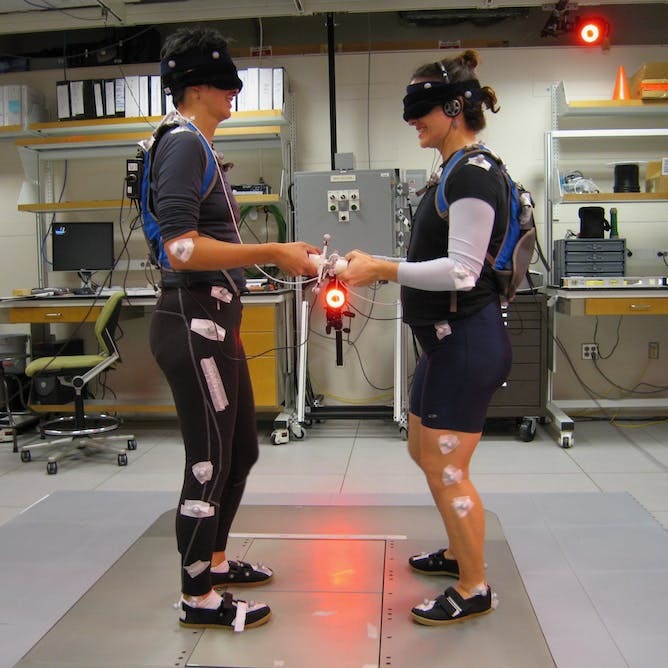 Jessica Allen, a soon-to-be assistant professor at West Virginia University, and expert in human gait, further showed that their motor modules were also more consistent in walking and balance tasks. Like the ballet dancers, adapted tango participants with PD could use the same motor modules across different motor tasks. That is, as they practiced their tango dancing skills, they developed motor modules that also helped them walk and balance in everyday situations. This mechanism may explain why practicing dance can beneficially alter gait and balance. We also collaborate with Georgia Tech roboticist Charlie Kemp, who is interested in ways that robots can interact physically with humans in intuitive and beneficial ways. For instance, could rehabilitation robots some day dance with people with Parkinson’s disease to help them improve their motor skills? Advancing the science of human physical interactions is critical to developing this kind of technology. Researchers are only just beginning to study the forces between two humans performing either cooperative (carrying a table together) or competitive (tug-of-war) tasks. In partner dancing, the physical forces between the leader and follower are key to the two individuals being able to stay in sync with one another. Such complex coordination between people can happen even with their eyes closed. We wondered if nuanced insights from partner dance could be used to develop intuitive physical interactions between humans and assistive robots. Roboticist Tiffany Chen had already developed a way for a humanoid robot, Cody, to be led by the hand by a human. The robot could follow a nurse through a complex environment simply by interpreting the forces from hand-holding. 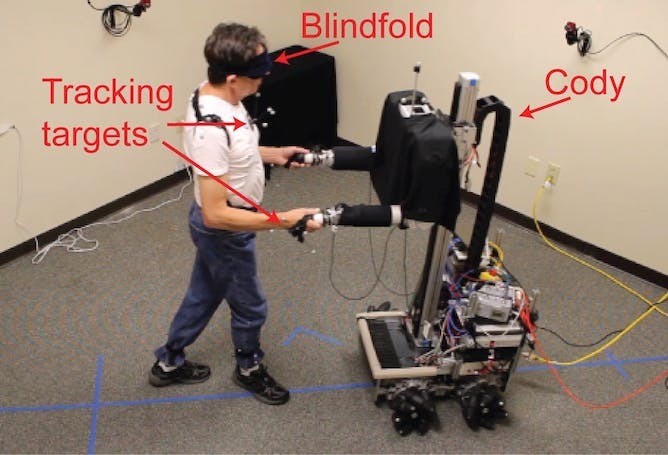 Does holding a robot follower’s hand feel like interacting with a person? Tiffany tested Cody with partner dancer instructors in a simple, partnered stepping task. Our expert partner dancers were surprised at how well Cody followed their touch. They felt that Cody could interpret subtle guidance through forces at the hands that signaled the direction and pace of movement. This type of physical guidance provided a much more intuitive way to direct the motion of the robot compared to the gaming pad that’s typically used. But we still wanted to compare the force at the hand and body movements of the human-robot partnership to two people dancing. Did Cody and a partner look like two people doing the same task? Our expert partner dancers headed back to the lab with Andrew. We found that the forces at the hands for coordinated movements in humans (even without vision) were less than a few pounds. That’s less than Cody needed to follow a person, so how we’d programmed the robot to respond to forces was less sensitive than a person. We are only just beginning to understand how the subtle changes in forces at the hands of human partners is interpreted. Since these forces were the only channel of communication between participants in our study, we know they contain information about motor intention (where we want to go), motor performance (how we are actually moving), as well the skill level of the partners. But the area of human-human physical interactions is ripe for guiding the design of assistive robots that interact safely and intuitively with humans. Can a robot ever be an effective rehabilitative dance partner? So far, we’re just starting to learn about the effects of dancing on human motor skill, as well as the physical interactions necessary to perform partner dance. More fundamentally, we seek to discover how we learn and re-learn to move, and how physical interactions help us to move better. Answering these questions may help us stay light on our toes.